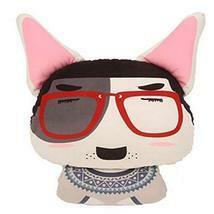 Ships from Hong kong.One size fits most(Specification:39x29 cm, Thickness:10.5 cm). These pillow have just the right softness to provide the most comfortable support for your neck. It helps relieve the tension in your neck and shoulders due to prolonged sitting. Use it on a plane, car, or anywhere you need the extra support for your neck and shoulders. You will definitely like the soft and comfortable feel of this pillow.